If you follow us on Facebook then you know that I received a rather large shipment in the mail from C&C Cola. I’m not sure I’ve prepared myself for the 24 flavors sitting in my fridge ranging from Banana to Watermelon and everything in between. Ok, so maybe “everything” is a bit of an overstatement, but it’s still 24 flavors no matter how to slice it. I thought a good way to start out our journey through C&C would be to review black cherry first. Black Cherry is a good mixture of the weird and common that most can still relate to in terms of flavor. With all of that going for it, it seemed the perfect jump off point. Honestly though I just happened to pull it out of the fridge first and my brain thought of better reasons than just happenstance. Let it be known that it seems most all, if not all, C&C creations are a conglomeration of HFCS and chemicals. As sad as this makes me it doesn’t mean they’ll taste bad since a couple of our top drinks use the HFCS… just more of an FYI for your tongue. Onward! An incredibly deep cherry flavor oozes its way out of the mouth of the bottle. It’s such a deep flavor that one might mistake it for grape upon a quick whiff. Black cherry should be on the lower levels of cherry in terms of taste so I’m optimistic to see where this is going. The flavor is not unlike that of sno-cone/snow cone/sno-ball syrup, but not nearly as thick. The rich flavor the smell promised is there in a somewhat limited amount and lingers in your mouth for a few moments after ingestion. Bubbles fizz their way around your teeth at the perfect level, in no way interrupting the taste or drinking experience to make themselves noticed. Even though C&C Black Cherry is sweetened with HFCS I don’t get a syrupy mouth-feel at the end of each sip. Is it as clean as something sweetened with Pure Raw Real Cane Sugar? No, but it exceeds the limitations that HFCS can sometimes put on a beverages mouth feel. 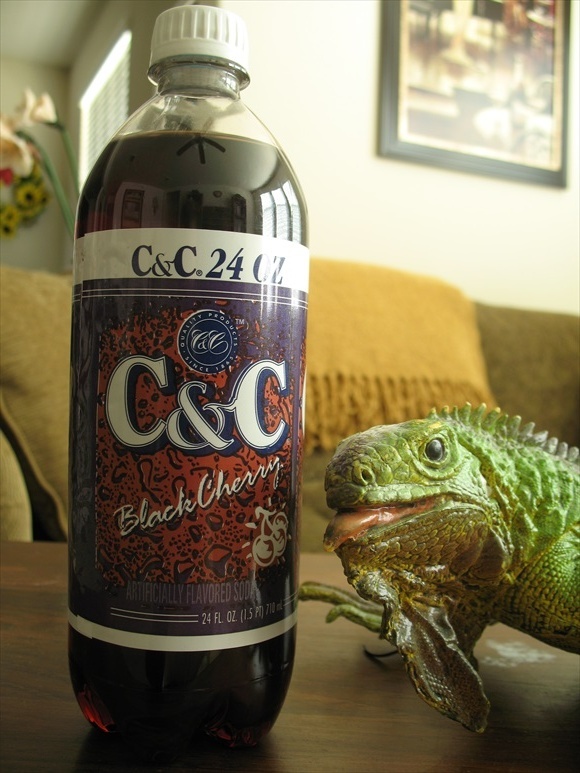 With all that said the flavor of C&C Black Cherry could be stronger with a bit more “pop” (haha, the only soda joke I know) and occasionally a hint of chemical taste shines through, but this is not the norm. C&C Black Cherry comes off as IBC Black Cherry’s little brother. Not quite as strong or as memorable a drinking experience as IBC and their parents always blame him when a lamp gets broken. As far as black cherry flavored beverages go this one is alright, but there are higher end sodas out there with a better taste.